Foam in place packaging provides unique customized cushioning properties. Foam in place packaging systems provide unique customized cushioning properties. It is extremely versatile because it molds around the product it is protecting. This molding happens when two liquid chemicals are injected into a high density polyethylene bag. Once this happens, the reaction begins to “foam” and expand to surround the item. This fills the void between the container and the product, creating a completely custom protective shell. This technology offers the highest degree of product protection available. It allows operators to work smarter and more simply for maximum productivity. It reduces or eliminates damage expense. Its small footprint maximizes space and cost efficiency, while increasing consumer confidence. Ask yourself, are you: constantly trying to manage consumable use, frustrated by unexpected equipment downtown, or annoyed about having to wait days for a technician? YOU’RE NOT ALONE. 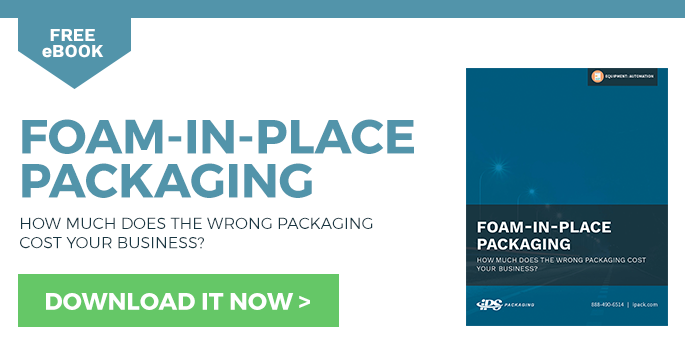 Packaging is easier, safer, and more efficient with foam in place packaging. But sometimes it takes moving your packaging into the 21st century to ensure that your products are arriving to your customers undamaged. You don’t want your brand and reputation tarnished by a shipping company’s 10% damage statistic. It’s the same way that your car can alert you to a potential maintenance issue before a catastrophic failure. So can many of the newest models of foam in place equipment. Designed to monitor, collect, and measure critical information. Information like foam and film usage, temperature, pressure, etc. Each time it’s operated, this system ensures that the machine stays up and running to your custom specifications. Any potential issues are automatically relayed back to your equipment provider’s service team and a technician is dispatched to fix the issue. Systems are optimizing uptime and ensuring proper system maintenance. For companies with multiple products of varying size and shape, a barcoding “smart” feature helps take the guesswork out of what bag to use and how much foam to use. The system is programmed to automatically dispense the precise amount of foam and film needed for the optimal pack-out of each product based on its unique barcode. The process is simple, automatic, and ensures that your bottom line is as protected as your product. The worst part about trusting your packaging line to machines? The downtime when they breakdown. Inevitably, something happens that requires replacing a part. No amount of preventative maintenance will stop you from needing to replace the brakes or shocks on your car, if you have it long enough. With traditional machines, replacing parts can take up to an hour. And who has that kind of time to spend on a machine, especially when you need to be pushing products out the door. With the newest technological advances in foam in place packaging, part replacements can take mere minutes. Quick and easy film roll loading is done via loading arms that take the potential for employee strain injury out of the equation.